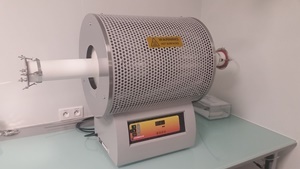 This tool can heat samples up to a maximal temperature of 1200°C and for several hours if necessary. This oven can operate under air or oxygen atmosphere. It is used in particular to oxidize silicon wafers. A scriber is a device for cutting in an extremely located and accurate way a sample of silicon, glass or ceramic (maximum thickness ≈ 10mm). The sample is maintained fixed to a suitable chuck, equipped with fine tunings (the whole placed under microscope) allowing to define with a high precision the cutting area. The cut is then made by means of a diamond point. 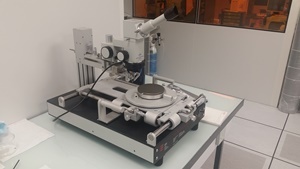 The accuracy of such an equipment is of 10µm, 0.006 °. 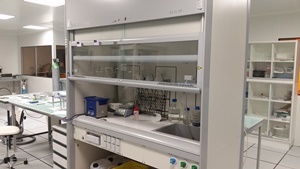 A sorbonne, two laminar flow hoods and one are available. Hotplates and an ultrasonic agitator equip these work plans. 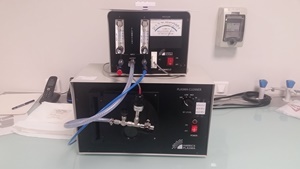 Machine working with oxygen or nitrogen gas, allowing to clean via a low energy plasma the surface of samples.